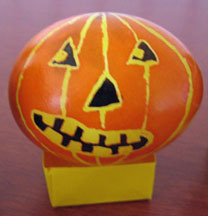 OK, this isn’t Origami — but I had to give a nod to Halloween and show off my Halloween Eggs. The nest is made of papier maiche, so at least paper is involved. And it highlights one of my other passions: eggs! This was a Martha Stewart Project from her October 2004 magazine. 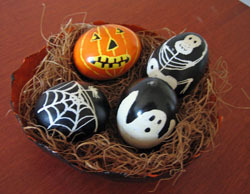 You can still find her Halloween Eggs pictures and instructions on her web site. A warning: it’s a lot of work and requires some special equipment (not to mention blowing out eggs)! Here they are sitting on some of my little sticky-note boxes (box how-to’s coming soon!). The pumpkin is my favorite…. followed by the spider web.